Bodyweight moves are great for developing a foundation of abdominal size and strength – but if you want to sculpt a rock-solid six-pack, you’ll need to start adding resistance. One of the most effective tools for the job is a kettlebell. Do three sets of ten reps for each exercise, resting for 45 seconds between sets and 90 seconds between exercises. For single-sided exercises such as the side press, do two sets on each side, alternating sides each set. To keep progressing, add a rep to every set each time you train, until you’re doing 15 reps in each set. After that, use a heavier kettlebell and go back to doing ten reps. The moves in this workout will help you develop your anti-rotation abilities, which enable you to resist being pulled out of position. They will also give you a comprehensive abs and core workout, targeting your rectus abdominis (the sheet of muscle that makes up your six-pack), side abs and lower back. If you’re not using kettlebells in your abs training, you’re missing a trick. 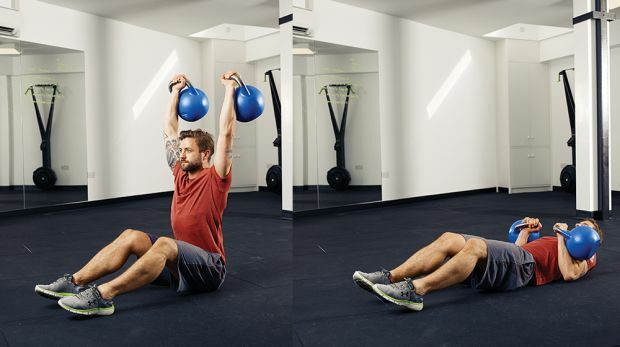 Lie on your back and hold a kettlebell in each hand by your chest. Straighten one arm and push upwards so your shoulder leaves the floor and you twist your torso. 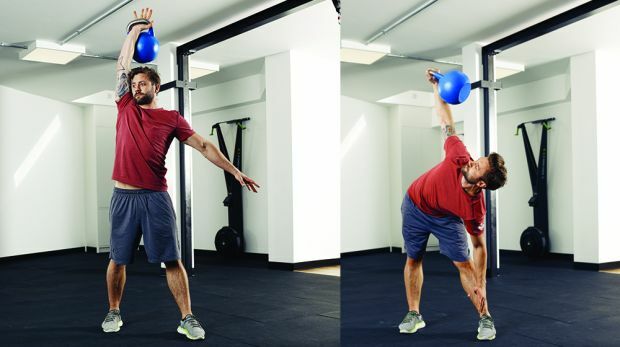 As you lower that kettlebell, extend the other arm to create a smooth rhythm. Expert tip: Lying on the floor reduces the instability, and therefore the risk, of the exercise. I get people to think about imprinting their lower back on the floor. That will help you to avoid overarching your lower back and switching off your abdominal muscles. Start with the weight above your head and your feet wider than shoulder-width apart. Your weight distribution should be biased towards the side that’s holding the bell. Look at the bell and, keeping your eyes on it, lower your torso until your hand touches the floor. Expert tip: Windmills look intimidating but they are an excellent move for building core stability and shoulder stability because they require a lot of control. They also give you a good hamstring stretch. 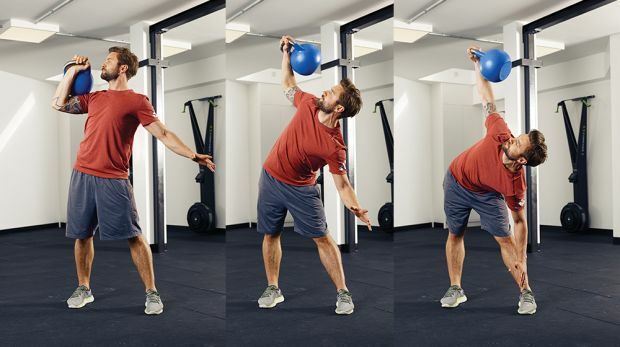 Start with the kettlebell at shoulder height. Brace your core and lower your torso to one side while simultaneously straightening your arm. Aim to keep the kettlebell in place so that it barely moves – instead, your body should move away from it. From there, reverse the move back to the start. Expert tip: This is a great obliques – side abs – exercise because you have to stabilise your torso as you push the weight away from your body. As you get lower, the intensity of the exercise increases and your centre of mass changes. That forces you to think about the constantly changing kettlebell movement and instability as you go through the exercise. Start by sitting down with your knees bent, holding two kettlebells overhead. 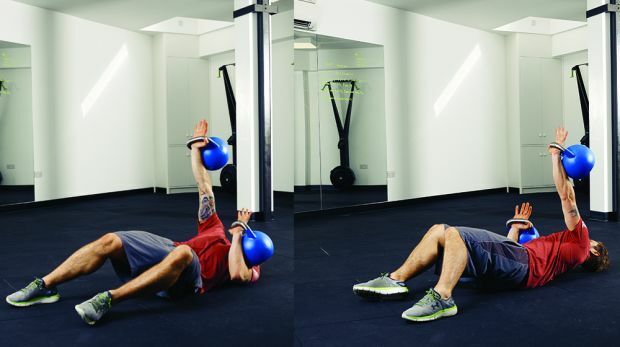 Slowly lower towards the floor while bringing the kettlebells down to your chest. Contract your abs to raise your torso while simultaneously extending your arms. Expert tip: Once you’re sitting up straight, tuck your pelvis under and, as you lower, ‘roll through’ your spine so you’re trying to make contact with the ground one vertebra at a time. Going slowly on this move will make your abs work harder. Get into a straight-arm plank position with your body in a straight line from head to heels, with a kettlebell positioned on one side of your body. Reach under your torso to drag the bell across to the other side. Switch hands and repeat the move. Expert tip: This is great way of making the plank more interesting. The wider you take the kettlebell, the hard it is to do. 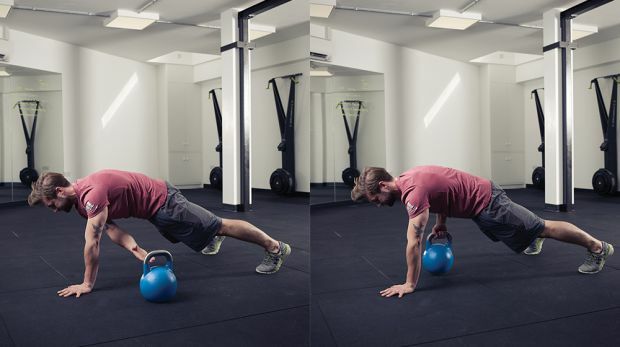 You can also try raising the kettlebell off the floor slightly to turn it into a modified reverse flye.